This handcrafted locket features a sterling silver posy and a gold key inside. A posy is defined as a small group of flowers or a bouquet, but it also means a brief sentiment or motto. 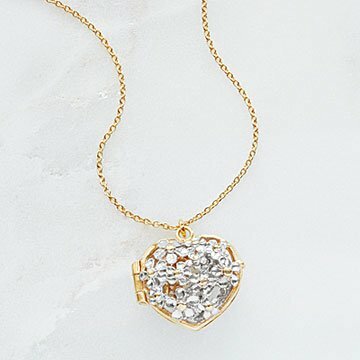 This locket, handcrafted using tiny sterling silver flowers, might just inspire you to create your own positive mantra. Designer Alex Monroe is known for his intricate pieces with their charming touches like the interior key dangling inside the pendant. It's a reminder that there is always outer and inner beauty to be discovered. Handmade in the UK. 24" sterling silver chain.